Lay-N-Go Traveler Makes Packing and Unpacking Easier | OhGizmo! Whether it’s a day trip, a weekender, or a week-long trip, the Lay-N-Go Traveler will be able to make packing and unpacking a whole lot easier for you. It’s a bag can be unfolded and transformed into a mat, effectively laying all your stuff in front of you. That way, you won’t have to rummage through your bag (and mess everything up in the process) in search for a single object. 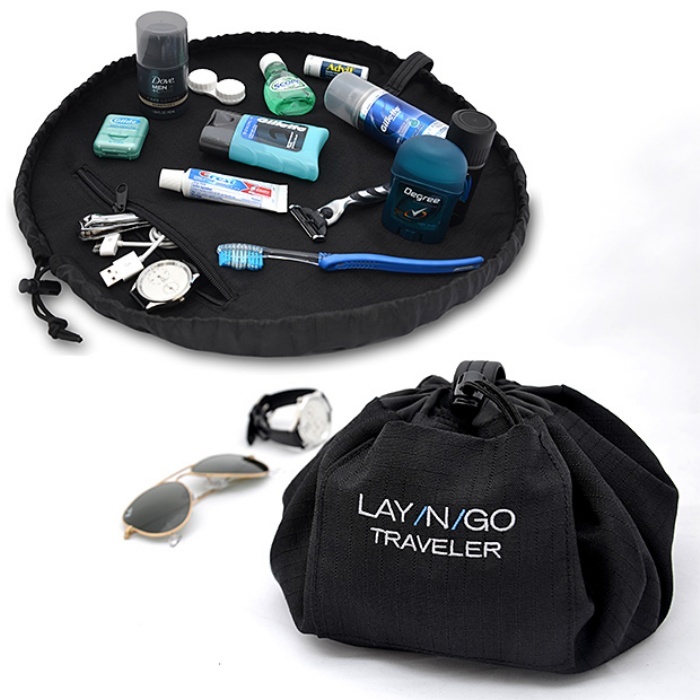 The Lay-N-Go Traveler isn’t meant to hold your clothes or extra shoes, given the size, but it’s perfect for personal effects and smaller essentials, like your toothpaste, glasses, razor, deodorant, and phone charger and cables, among other things. It’s also available in another size, the Lay-N-Go Lifestyle, which is a larger version that you can use to carry more stuff like food for a picnic or toys for kids to play with at the beach. The Lay-N-Go Traveler is priced at $29.95, while the Lifestyle costs $49.95.